What was the fee structure of Warren Buffett’s first investment partnership started in 1956? There was no management fee. In fact, there was actually the opposite. The initial investors, the limited partners, were paid interest of 4%, which would be “charged as expenses of the partnership business”. With regards to the performance fee for the general partner, each of the seven limited partners would get their pro-rata share of 21/42 or 50% of any net profits and the other 21/42 or 50% of net profits would go to the general partner, Buffett. My interpretation of this is that if the investment partnership performed below 4% during a given year based on the limited partner’s previous year-end capital balance, Buffett was on the hook to fund any shortfall to meet that 4% interest payment to that limited partner. Whether the interest payments could fall into arrears or be deferred is unclear. If the fund returned 4%, Buffett would get 0%. 4% would go to funding the interest payment to limited partners. If the fund returned 10%, then 4% of that would go to funding the interest payment to limited partners and the remaining 6% would be split 50/50 between the limited partners and Buffett. If the fund returned 2%, then Buffett would have to come up with the 2% shortfall to meet the required 4% interest payment. If the fund returned 0%, then Buffett would have to come up with the 4% shortfall to meet the required 4% interest payment. 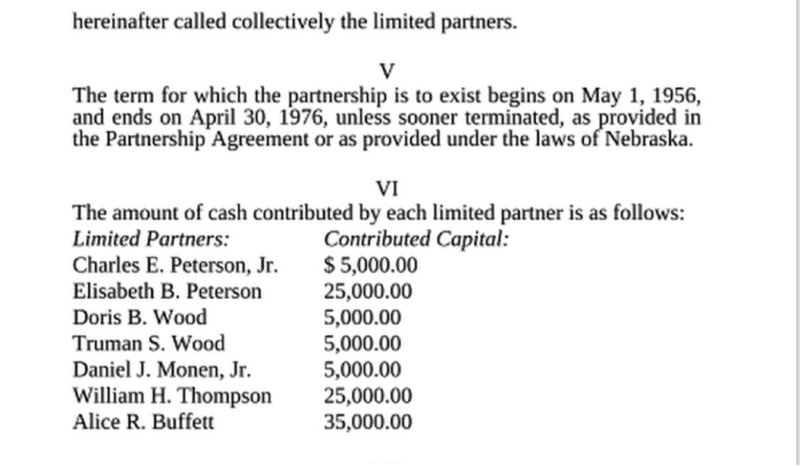 If the fund was down 40%, then Buffett would have to fund 4% of that loss and the limited partners would be down 36% on a net basis.Picture: A replication of the Certificate of Limited Partnership from 1956. Full document below. If the fund returned 2%, then Buffett would have to come up with 25% of the 2% shortfall to meet the required 4% interest payment, so 0.5% would be paid by Buffett and the remaining 1.5% “paid” or absorbed by the limited partners. The limited partners would ultimately get 2.5%. If the fund returned 0%, then Buffett would have to come up with 25% of the 4% shortfall to meet the required 4% interest payment. So Buffett would pay the limited partners 1% and 3% would be “paid” or absorbed by the limited partners. If the fund was down 40%, then Buffett would have to fund 25% of 44% (40%+4% interest) or 11%, and the limited partners would be down 33% below 4% or down 29% on a net basis. I am wondering if the 1958 amendment changed the 4% interest payment into a 4% hurdle, such that Buffett would only be on the hook for paying 25% of negative returns below zero. In this case, if the fund returned 2%, Buffett would not be on the hook for anything; if the fund was down 40%, then Buffett would cover 25% of that by chipping in 10%, to leave the limited partners with a net negative 30% return. However, what’s interesting is that he states, “So if I broke even, I lost money.” So this seems to suggest that if he broke even, returning 0% for the fund, he still had to pay up, which leads me to believe that he still had to pay 25% of the 4% threshold shortfall when breaking “even”, suffering a loss of 1%. Mary Buffett and David Clark, The Buffettology Workbook: Value Investing The Warren Buffett Way, p. 280-283. Alice Schroeder, The Snowball: Warren Buffett and the Business of Life - pages 179-180.